From the 1924 article "The Worship of Muruka or Skanda (The Kataragama God)"
“An old Brahmin hermit” whom I knew, Sri Kesopur Swami, was for about three quarters of a century a revered figure at Kataragama. He had come there as a boy from a monastery in Allahabad in North India in the twenties of last century. He attached himself to the Hindu foundation of the Teyvayanai Amman kovil and monastery. This institution belongs to a section of the Dasanami Order of monks founded by the great Sankaracharya of Sringeri Matam (Mysore). The lad after a time betook himself to the forest, where he lived alone for years, until he was sought out and restored to human society by a young monk, Surajpuri Swami by name, whom also I knew. The latter was a beautiful character, pious and learned, and with a splendid physique. He had been a cavalry officer of the Maharaja of Cashmere and, being resolved on a life of celibacy and poverty, found himself thwarted by his relatives who pressed him to marry and assume the duties of family life. Failing in their efforts, they brought the Maharaja's influence to bear upon him, whereupon he fled from home and traveled as a mendicant until he reached the great southern shrine of Rameswaram, well known to tourists and a great resort of pilgrims. There (he told me) he received a divine call to proceed to Śrī Pada, the "Holy Foot" (Adam's Peak of English maps), which the Hindus revere as sacred to Siva and the Buddhists to the Buddha. Here he was ordered to proceed to Kataragama, where he would find a hermit in the forest whom he was to wait upon and feed with rice. This he did and brought the hermit to the temple. He soon gave up rice or other solid food and confined himself to a little milk, hence he was known as Pal Kudi Bawa (Tamil: 'Milk-drinking Recluse'). A very saintly and picturesque figure he was, revered for his childlike simplicity and purity, spiritual insight and devotion, and much sought after for his blessings. He died in Colombo in July 1898 at a ripe old age. His remains were taken to Kataragama and a shrine was built over them by his votaries. His pupil Sarajpuri survived him only a few months and died in November 1898. 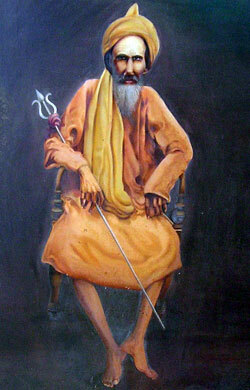 The hermit told me of a saintly woman named Balasundari who lived there. She was the eldest child of a North Indian raja, a boon from the Kataragam God in answer to a vow that, if blessed with children, the first born would be dedicated to his service. The vow was forgotten and a stern reminder led to her being brought by the father while still a child and left at Kataragama with a suitable retinue. She devoted herself to spiritual life. The fame of her beauty reached the King of Kandy, who sent her offers of marriage, which she rejected. He would not be baulked and sent troops to fetch her to the palace. But, said the hermit, the God intervened and saved her. He brought the British troops to Kandy, and the king was taken prisoner and deported to Vellore in South India. This was in 1814. The lady, thus saved from the King's rough gallantry, lived to a good old age, loved and revered, and died at Kataragama after installing Mangalapuri Swami, who died in 1873 and was succeeded by my venerable friend Kesopuri."